Well, we finally moved out of the hotel we’ve been staying in for the past three months and spent our first night back home. Even though the house is in disarray, with most of our stuff still in boxes or missing, we are so happy to sleep in our own bed. In case you didn’t know, we had to vacate our home on April 9 because of a small kitchen fire. We hired a restoration company to rid the house of the smoke damage and repair the kitchen. We never realized that we were signing up for 104 days away from home. I won’t share all the details of this unhappy story now as there is still much to be resolved and settled. But it’s good to be home despite the frustration of not being able to locate all our stuff. One thing we did learn from living in a hotel for three months is that you can get by on a lot less stuff than we thought. 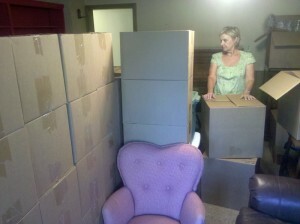 The question for us now is: how much of all this stuff still in boxes do we want to just get rid of? This entry was posted in Personal and tagged house fire, restoration companies. Bookmark the permalink.